Unfortunately, the Caucasus often conjure images of violence and war in the minds of many people. Indeed, the region has been plagued by violent conflict especially during the collapse of the Soviet Union and through the first decade of independence. Specifically, the Caucasus has one of the highest concentrations of separatist territories in the former Soviet space and the entire world. Scholars have widely debated the causes of this issue, focusing on various factors. This paper identifies the leading causes of conflict, which although they may not have been direct causes per se, were significant in facilitating the eruption of conflict. Importance is first given to the legacy of the Soviet Union and its ethno-federalist structure, and then the analysis moves to examine demographic conditions, historical grievances and discriminatory policies, the role of ethnicity, state disintegration, and finally the role of the Russian Federation. However, it must be noted that while this article considers the main factors of violent conflict in the secessionist territories, not all of these factors carry the same weight across the board. The focus of the following analysis is thus on the factors that are most applicable, while noting peculiarities and distinctions for each case. When the Bolshevik leadership of the Soviet Union was in the process of establishing republican borders, they aimed to create an ethno-federalist structure, in which in most cases there was a one-to-one correspondence between territory and ethnicity (natsional’nost’)1. However, this was not always feasible, especially in ‘shatter zones’ with highly intermixed and dispersed ethnicities, such as in Dagestan, where there was no titular group (Brubaker, 1996). Fifteen nationalities were given the highest standing of Soviet Socialist Republics (SSRs), according to Stalin’s four criteria: a set territory, national language, culture, and economy2 (Bohr 1996). Within these fifteen republics were, in order of decreasing standing, twenty Autonomous Soviet Socialist Republics (ASSRs), eight Autonomous Regions (oblasti), and ten Autonomous Areas (okruga)(Bremmer 1993). And yet, only fifty-three out of over one hundred national identities were officially recognized and thus granted special rights at the Twelfth Party Congress in 1923. The legacy of ethnically defined territories during the Soviet Union is especially crucial to our understanding of conflict in the region because with territorial autonomy, the lines along which the USSR would collapse were established. Each autonomous unit, through the policy of indigenization (korenizatsiya), had its own administrative and regional councils, managed by local cadres. Once Soviet power collapsed, these regional bodies were converted into state institutions. Without these pre-made arrangements, King (2008) argues, “the post‐Soviet wars might never have gotten off the ground” (pp. 219). On the other hand, non-titular ethnic groups that lacked their own institutions, such as the Lezgins in both Azerbaijan and Dagestan, were far less likely to mobilize, and if they did, there was not a tendency to demand secession from the host republic (Bunce 2004). Scholars have thus identified a high correlation between a history of having an ethnically defined territory and ethno-territorial conflicts in the Caucasus. Indeed, all of the separatist territories in the Caucasus had some form of autonomy in the Soviet Union. Notably, Abkhazia was originally given full SSR status in 1921, but then downgraded to an ASSR in 1931. The experience of conflict in the Caucasus differs from that of other places in the world, where autonomy was usually successful in avoiding violence (Cornell 2001). This correlation also differs in other parts of the Soviet Union, excluding the Caucasus, where violent conflict erupted without the existence of an ethnically defined territory3 (Rezvani 2008). The main feature of those territories that erupted in conflict is that their titular population was, or once was, the majority. Armenians in Nagorno-Karabakh, Ossetians in South Ossetia, and Chechens in Chechnya were the clear majorities in their territories, while the Abkhaz in Abkhazia comprised of a majority at the beginning of the Soviet period but later became a minority (Zurcher 2007). Nonetheless, the Abkhaz retained the highest proportion of positions in their local government over all other ethnicities in Abkhazia. Like Abkhazia, Adyghea was named after its local Adyghe or Circassian ethnic group, but does not make up a majority there and their ethnic-brethren are also found in Karachai-Cherkessia and Kabardino-Balkaria (Rezvani 2008). Neither Adyghea nor the other territories where Circassians are present erupted in conflict, despite significant mobilization based on Circassian identity. The lack of demands for separatism among the Circassians could have to do with the dispersed nature of their group across Adyghea, Kabardino-Balkaria, and Karachai-Cherkessia. Both Toft (2003) and Cornell (2001) assert that one criterion for the eruption of conflict is when a group is compactly settled in a defined geographical area, and thus the fact that the Circassians were scattered may have lowered either their motivations, legitimacy, or capability to demand secession. One exception where conflict did not erupt is Adjara, where the titular Adjars were compactly settled within their autonomous unit. One reason for violence being avoided could have to do with the fact that Adjars are a Georgian subgroup and thus there was a perceived compatibility with a broader Georgian identity. However, the Abkhaz could fit into this middle range, as there were other ethnic groups present in Abkhazia4. In this case, it seems that the history of the Abkhaz being a titular group and dominating the local government, while not always comprising of a majority, had a role in the outbreak of conflict. Going even further, some scholars have even posited that in the Caucasian republics that are not mono-titular (Karachai-Cherkessia, Kabardino-Balkaria, Dagestan), ethnic competition reduced the prospect for violent conflict and kept ethnic groups from embracing separatism (Rezvani 2008). In general, the demographic composition of a society is a helpful tool in examining the outbreak of conflict, but by itself does not explain why conflicts erupt and is not a cause. However, it is necessary to examine this aspect in order to understand dynamics between ethnic groups and why one might feel marginalized vis-à-vis another. There were two features that caused the autonomous regions to mobilize, besides the ethno-federalist structure, along ethnic lines and against their host republics: historical grievances and discriminatory policies. Regarding the former cause for ethnic mobilization, its probability was higher if the minority group in question possessed historical grievances against the host republic. When an ethnic group possesses certain grievances, they may feel a stronger sense of attachment and national identity is usually strengthened (Fowkes 2002). Examples of such grievances are the twentieth century deportations of many peoples of the North Caucasus to Central Asia, Russian colonialisation, demands for an upgrade or change of autonomous status, perceived economic differences between the autonomous territory and the host republic. The mere existence of historical grievances is not a determining factor of conflict, but when it is combined with the second cause for ethnic mobilization, discriminatory policies, the minority group will fear that its existence is under threat. Lobell & Mauceri (2004) have stated that during a time of transition, a minority may fear that the governing majority would actively pursue discriminatory policies, such as removal of their existing positions in the government and state institutions and assimilation procedures that would marginalize them in the region. In many cases across the Caucasus, this is precisely what occurred. In the last days of Soviet power, Gamsakhurdia passed a law prohibiting regional political parties prior to elections in Georgia (de Waal, 2010). 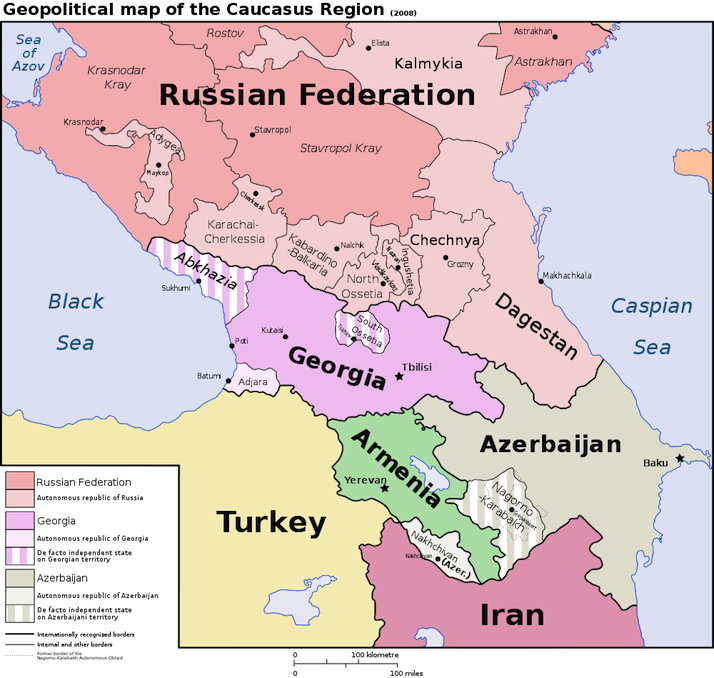 With the declarations of independence of South Ossetia and Nagorno-Karabakh, Azerbaijan and Georgia responded by liquidating the regions’ autonomous status, thereby removing their special protections and rights and increasing fears among the Ossetians and Karabakh Armenians of further discrimination5. Moreover, Georgia categorically refused to even refer to the territory of the Ossetians as ‘South Ossetia,’ instead naming it either Samachablo, referring to Georgian princes, or Shida Kartli, implying that it was an extension of the medieval Georgian kingdom of Kartli. Derluguian (2005) refers to such acts as symbolic violence, which can oftentimes lead to actual violence. It is important to mention that discrimination existed not only against minorities, but also against majorities. Individuals of the titular ethnic group living in an autonomous territory would oftentimes complain of the disadvantages they faced. Discriminatory policies inevitably serve to radicalize ethnic groups; since the survival of their group is at stake, the moderate leadership, which usually comprises a majority in a certain group, will be forced to take a more radical position, leading to ethnic mobilization, and possibly violence or even secessionism (Barrington 2006). Many scholars have mistakenly and simplistically speculated the causes of the many conflicts in the Caucasus to be ethnicity itself along with pre-existing ancient hatreds between certain ethnic groups. Some have gone even further to claim that the very existence of so many ethnicities in such a small area inevitably led to conflict. War did not suddenly erupt between two groups after the collapse of communism because of mutual hatred, but in part because of the increasing use of force to claim territory as one’s own. Inter-communal clashes did exist before and during the Soviet period, but as King (2008, pp. 213) states, referring to the Nagorno-Karabakh conflict, these clashes “manifested themselves in different ways: heated debates among historians in learned journals; ethnic hooliganism during soccer matches between Baku and Yerevan teams; or underground publications about human rights abuses against ethnic Armenians in Azerbaijan.” While opposing sides were arranged along ethnic lines, one must not see ethnicity as the main source of conflict. Instead, when we see ethnicities as interest groups fighting over a territory, which becomes reinforced or even reinvented as a symbol of the nation, it becomes clear that the actual role of ethnicity is not so strong, and that the conflicts have undergone ethnicisation. As Zurcher (2007, pp. 40) poignantly states, “revolutions and wars are not the work of nations but are work in the name of nations.” Because the USSR began to collapse along the republican lines drew during the early Soviet period, ethnic ties became the most obvious and readily available means to cope with the unstable environment. As the Soviet republics approached secession from the Soviet Union, some of the former autonomous territories sought to capitalize on the situation by demanding guarantees for the protection of certain political and cultural rights. When the republics rejected these demands, a ‘war of laws’ ensued, where the republics rejected the legitimacy of the laws enacted in the autonomous territories (de Waal, 2010). In this hostile environment, ethnic nationalism became prevalent, and majority groups mobilized against the minorities of the autonomous republics (Zaslavsky 1992). Ethnic nationalism became the main means of expressing opposition to Soviet rule and consequently, national movements transformed into political parties. Alongside the movements’ calls for independence from the Soviet Union, they became intertwined with maintaining the territorial integrity of their states and rejecting secessionist projects. Conflict was probable in cases where ethnic groups of the autonomous regions failed to identify with the civic identity of their host republic (Cornell 2001). It is evident that, to different extents, the host republics were unable to consolidate nation building to incorporate the identities of certain minorities. Ethnic groups funded historical research and textbooks “with the common aim of restoring the ‘lost past’ of the nation: this often meant that neighbouring peoples promoted enthusiastically diametrically opposed versions of their, and their neighbours’, past” (Fowkes 2002, pp. 176). But, this was not true in all cases. For example, in Georgia, the Mingrelians, Svans, and to a certain extent, the Adjars, were able to broadly incorporate themselves into the titular Georgian identity. The same is true of the Talysh, Lezgin, and Kurds in Azerbaijan. However, the South Ossetians, Abkhaz, and Karabakh Armenians were not able to accomplish this, and their ethnic identities were preserved, and even seen as incompatible with the titular identity (Cornell 2001). Overall, the organization of society along tribal, clan, and kinship lines complicated identification with the titular nationality and varied to different extents. Scholars have disagreed over the sources of ethnic nationalism in the Caucasus. MacFarlane (Cornell 2001) has linked its appearance with the lack of political culture in the Caucasus (lack of experience in participatory politics, etc…), while Aphrasidze & Siroky (2010) with belated development. Derluguian (2005) points to the structure of society in the Caucasus as an explanation for the receptiveness of ethnic nationalism. He explains that because of the existence of a large ‘sub-proletariat’ class7, who became political active and were the most likely to embrace radical nationalist ideals, nationalist movements gained a significant boost to their support. This is particularly true in the case of the Nagorno-Karabakh conflict, which instead of being elite-led, was actually mass-led in character (Cornell 2001). Some scholars have emphasized an instrumentalist account, describing that the manipulative policies of nationalist elites who came to power in the Caucasus in the early nineties caused the emergence of ethnic nationalism. However, having examined aspects such as grievances, perceived discriminatory policies, and the ethnicisation of conflict, it becomes clear why the policies of these elites resonated with their population. Furthermore, some of these nationalist leaders (Elchibey, Gamsakhurdia) eventually lost power once it became clear that their policies were not successful. Abushov K, 2009. Policing the Near Abroad: Russian Foreign Policy in the South Caucasus. Australian Journal of International Affairs, 63(2), 187-212. Aphrasidze D & Siroky D, 2010. Frozen Transitions and Unfrozen Conflict, Or What Went Wrong in Georgia? Yale Journal of International Affairs, Vol. 5, No. 2, 121-136. Barrington L, 2006. Introduction: Nationalism & Independence, in “After independence: making and protecting the nation in postcolonial and postcommunist states,” Barrington L (ed. ), The University of Michigan Press, Ann Arbor. Bohr, A. 1998 ‘Turkmenistan and the Turkmen’, in The Nationalities Question in the Post-Soviet States, ed. Smith, G., Longman, London. Brubaker R, 1996. Nationalism reframed: nationhood and the national question in the New Europe, Cambridge University Press, Cambridge. Bremmer, I. 1993. ‘Reassessing Soviet Nationalities Theory’, in Nations and Politics in the Soviet Successor States, eds. Bremmer, I. and Taras, R., Cambridge University Press, Cambridge. Bunce V, 2004. “Is ethnofederalism the solution or the problem?” in Nationalism after communism: lessons learned, (eds.) Mungiu A & Krastev I, Central European University Press, Budapest. Cornell S, 2001. Small nations and great powers: a study of ethnopolitical conflict in the Caucasus, Curzon Press, UK. Cornell S, 2002. Autonomy and Conflict: Ethnoterritoriality and Separatism in the South Caucasus – Cases in Georgia, Department of Peace and Conflict Research, Report No. 61, Uppsala. de Waal T, 2010. The Caucasus: an introduction, Oxford University Press, New York. Derluguian G, 2005. Bourdieu’s secret admirer in the Caucasus: a world-system biography, The University of Chicago Press, Chicago. Fowkes B, 2002. Ethnicity and ethnic conflict in the post-communist world, Palgrave, New York. King C, 2008. The ghost of freedom: a history of the Caucasus, Oxford University Press, New York. Lobell S & Mauceri P, 2004. Ethnic conflict and international politics: explaining diffusion and escalation, Palgrave Macmillan, New York. Rezvani B, 2008. “The uniqueness of the Caucasian conflicts?” in “Caucasus Studies: Migration, Society, and Language,” (ed.) Vamling K, Caucasus Studies 4, Malmo University. Toft M, 2006. The geography of ethnic violence: identity, interests, and the indivisibility of territory, Princeton University Press, Princeton & Oxford. Zaslavsky V, 1992. Nationalism and democratic transition in postcommunist societies, Daedalus, Vol. 121, No. 2, 97-121. Zurcher C, 2007. The post-Soviet wars: rebellion, ethnic conflict, and nationhood in the Caucasus, New York University Press, New York & London. Salvatore J. Freni graduated in 2012 with a concentration in Russian and Eastern European Studies from University of Birmimgham in Birmingham, United Kingdom.